Say Nothing, Act Casual: And so the rant ends. And perspective is regained. And so the rant ends. And perspective is regained. Firstly, thank you. Thank you all. It's happening to us all. You know, what I wrote about in my last blog. In view of my poor behaviour yesterday, I was a saint this morning. This is in spite of the fact that at 6am I received a text telling me band rehearsal was off, which meant me and my compadre band parent had to contact 40 people before 7:45 (preferably 7:30) by email or phone and tell them not to drop their child at school early as no-one would be there. I let Josh load up the ipod game he's been desperate for because he was ready for school at 7:45am. I even let him play it for 5 minutes. 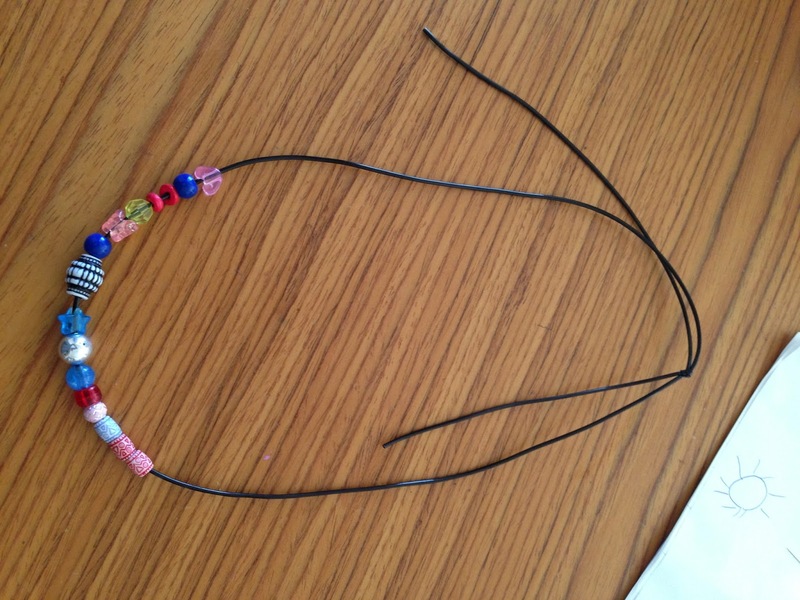 Issy made me a beautiful necklace. I loved and admired it and wore it all day (except during yoga when it may have injured me). My kitchen came. That's it. No installation, just delivery. Apparently installation is tomorrow. It's sitting like a big white jigsaw puzzle in our family living room. I'm glad it's not me working the jigsaw out. It's like torture, I have a kitchen, but not really. But, it's real and it's in my house. I thought this day would never come. We also have a beautiful new glass pool fence. On it's own this would have been exciting but unfortunately for it, the kitchen took most of my tiny attention span. I haven't even taken a photo of it. I know it's not just me, we are all trying to juggle too many balls. And your wonderful comments on FB and the blog confirm it. We are all overcommitted and sometimes it makes us grumpy. And I also know we do this because we hate to say no, to let down a child, or a friend, to not contribute to our community. I guess I'd rather be overcommitted than sitting around on my bum. I've made some most totally excellent friends through my habit of biting off more than I can chew! We (well I know I do this but I suspect I'm not alone) all say we don't care if we drop a ball, but we do. Because it reflects on us. These kids are reflections of us, and if they are rude and selfish and disrespectful and unpleasant and irresponsible, well, what does that say about us? So we do nag, because, as a very wise commenter said on FB, because we care. We LOVE these insane and irritating small people we have created. We'd die for them. And they, in their turn, despite us being just as irritating to them, LOVE us back. And make us necklaces. And snuggle into our laps, even when their legs are dangling off and they can wear our shoes. I want my kids to feel taken care of and safe and sometimes indulged. Because if I don't do it, who will? They need a soft place to fall when the world is hard on them, and that's me (and Mike) but I think mainly me, because Dads are different. Their role is different, the way they show their love for their kids is different, even if the how much is the same. Mums are the soft fall of the world. And the parachutes. How does THAT work? Both the cause of the soft landing, and the soft landing itself. Is that even possible? Goodness I am profound. And questing for meaning. Please bear with me.